Cost: Oblix Lounge & Bar offers various menus depending on the day and time. During weekdays there is a deli menu priced at £29 for three courses and on weekends the champagne brunch is £58 for three courses. The evening menu is a sharing menu with starter-size plates ranging from £6 to £18.50, seafood dishes from £24 to £38 and meat dishes from £18.50 to £80. About: Oblix on the 32nd floor of the Shard offers some of the most spectacular views over Central London that money can buy. Oblix is divided into two sections - the Restaurant and the Lounge & Bar, both with different menus and different perspectives. The Restaurant serves a more formal à la carte menu overlooking St Paul’s, whereas the more relaxed Lounge & Bar offers a deli menu during the day, brunch on weekends, and a sharing style menu with wonderful live music in the evenings (comes with a £5 cover charge). 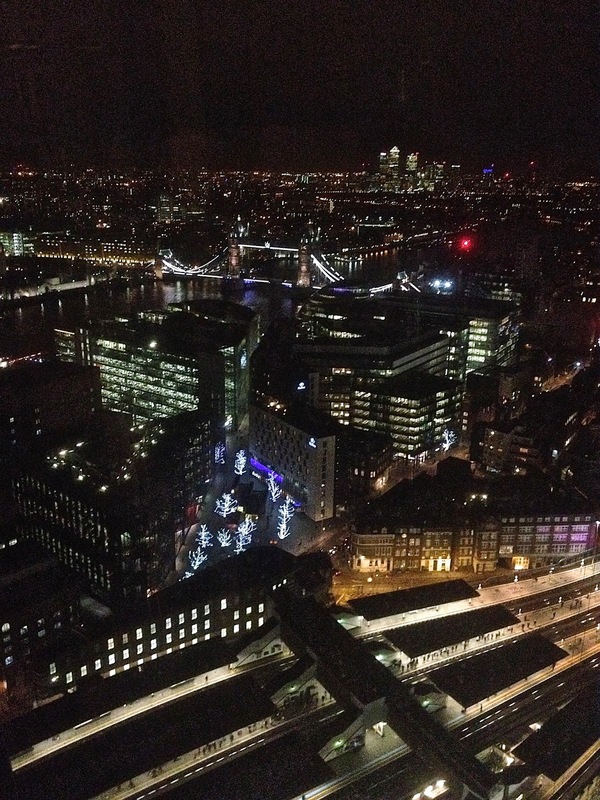 From the Lounge & Bar diners have a view over London Bridge and Tower Bridge which dazzles at night. 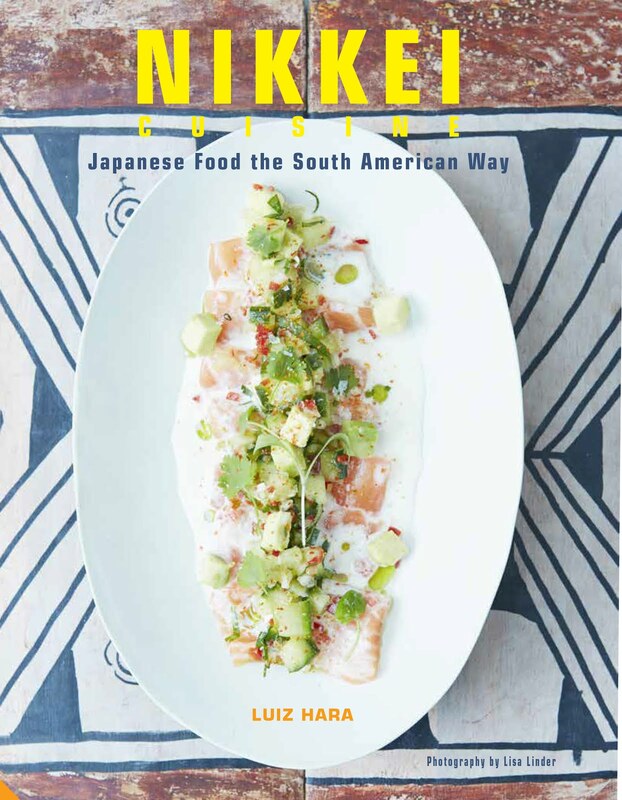 The mastermind behind Oblix is Rainer Becker, who along with Arjun Waney launched Zuma and Roka, helping to explain the various Asian influences in the Oblix menu. 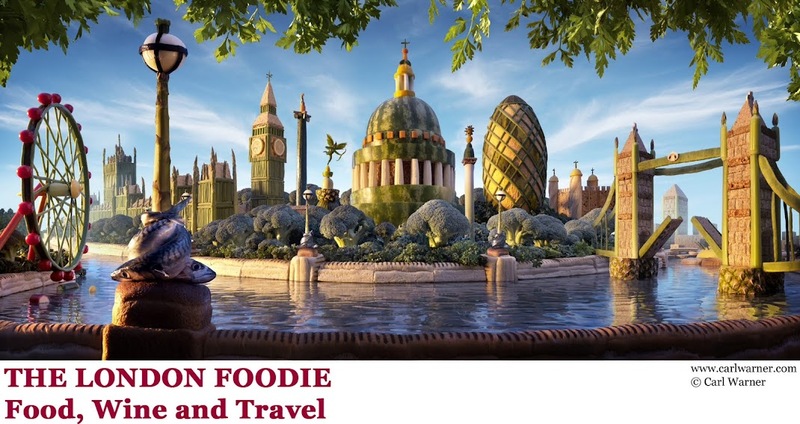 The Executive chef is Fabien Beaufour who previously worked in The States at The French Laundry and Eleven Madison Park, both of which are three Michelin starred restaurants. What We Ate: AGirlHasToEat and I dined in the Oblix Lounge & Bar and we really enjoyed it’s buzzy ambience and the sultry tones of the live band. We started our meal with some fabulous tidbits from the small bites section of the menu including fried padron peppers (£5.50) and devilled eggs (£3.50 each), both of which were wonderful. 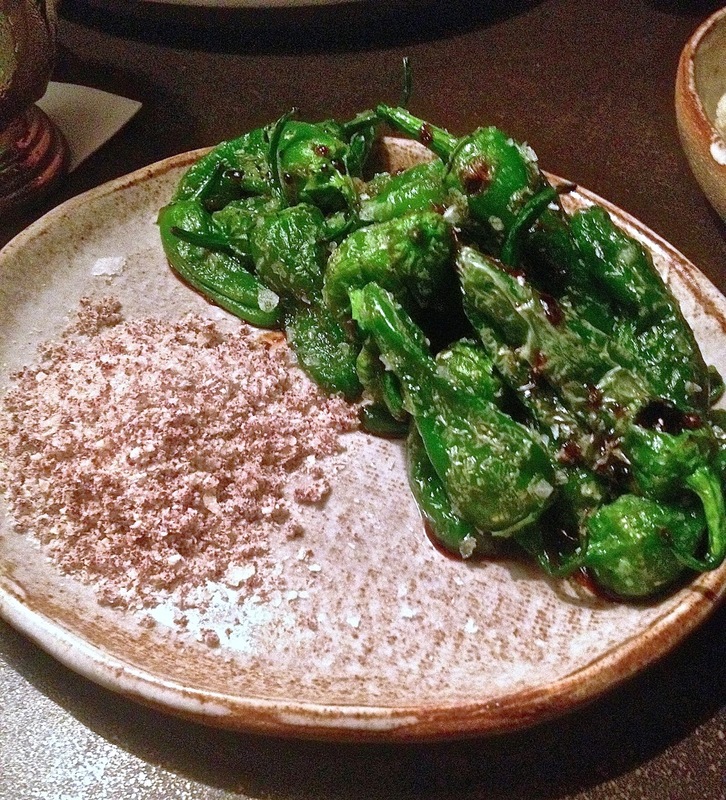 The padron peppers had been sprinkled with crispy panko crumbs that gave them a lovely crunchy texture. Accompanying the peppers was a salt and balsamic powder that provided a nice touch of seasoning and an acidic contrast. The devilled eggs were also gorgeous. 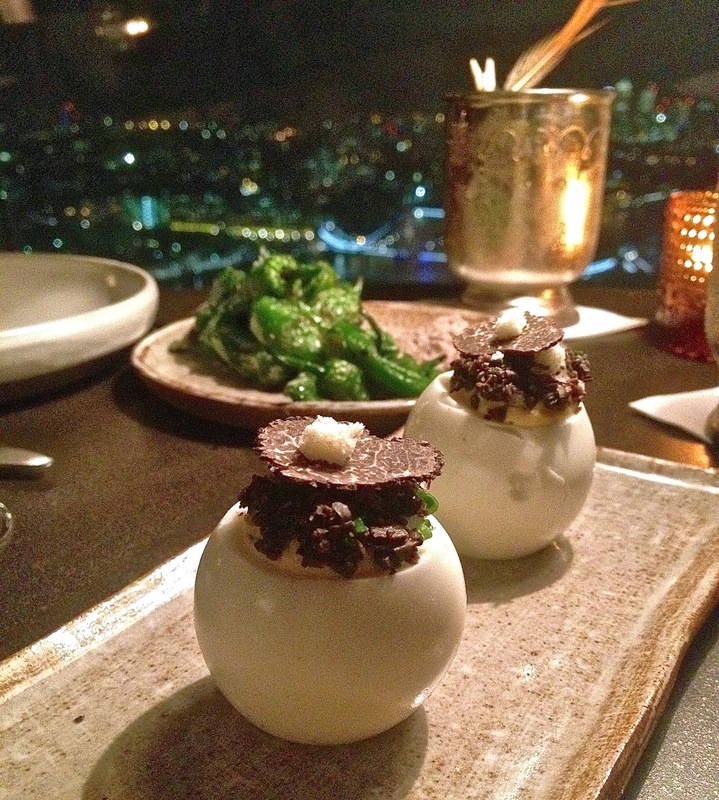 Smooth and creamy, they had been topped with slices of aromatic truffle that heightened the flavour of the eggs. Crispy fried squid with salt and vinegar (£8) was delicious and well seasoned. The squid was tender and the batter was really well made as it was as light as a feather and very crispy. 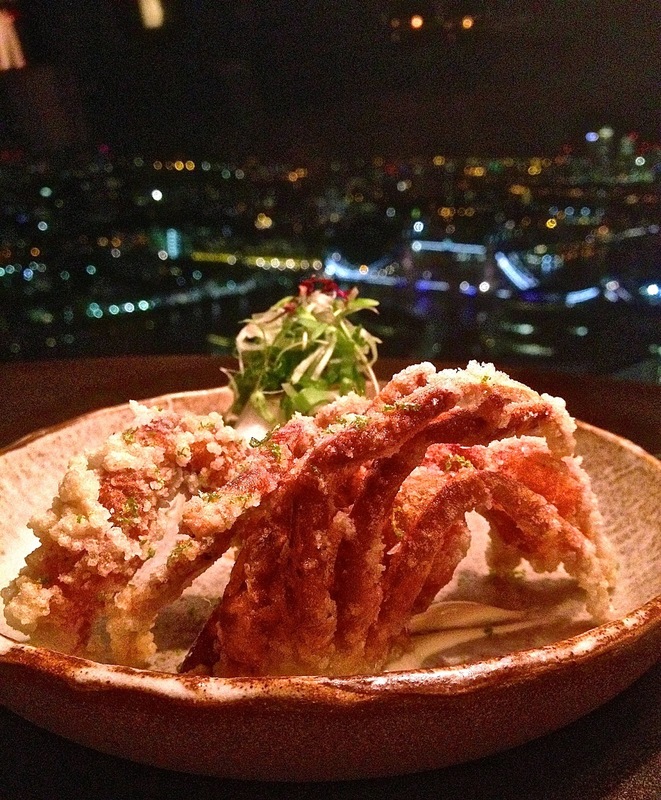 Also tasty was the crispy soft shell crab (£14.50). The crab was meaty, the batter was crispy, and it came with an interesting combination of kimchi and marinated daikon that gave the dish acidity and a charismatic contrast. From the raw section, a scallop and seabream ceviche (£18.50) was heavenly. The both scallops and sea bream were very fresh, particularly the scallops which had an intensely sweet flavour. 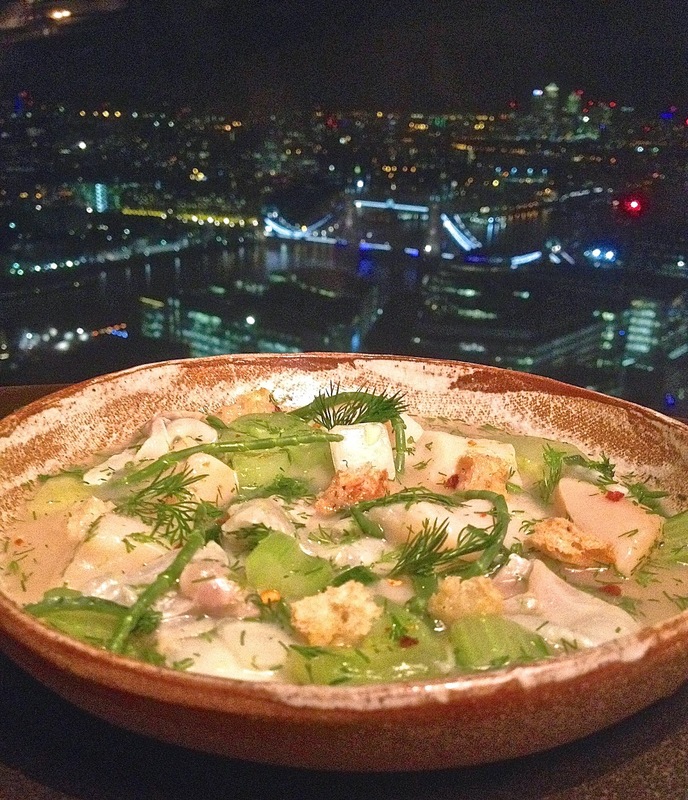 Within the ceviche were crunchy samphire, cucumber and some aromatic dill that added a resounding freshness to the ceviche. There was also a pleasant hit of chilli and crunchy croutons to round out this dish. 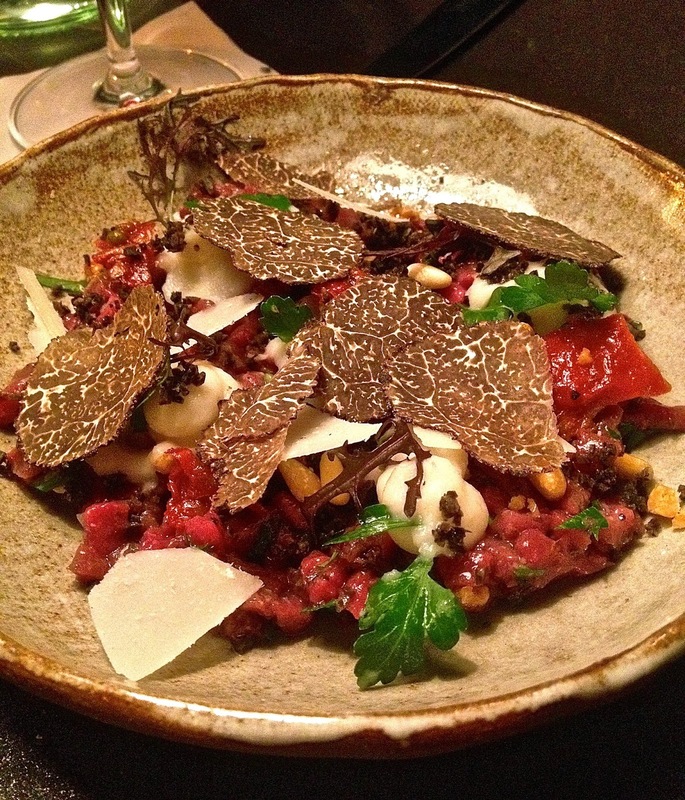 Venison tartare with parmesan and truffle (£13) was delicious. The venison was meaty and it combined well with the earthy nuttiness of the parmesan and the aromatic truffle. The use of some lightly toasted pine nuts helped to make this dish special. We tried two different seafood dishes, the first of which was the lobster with bone marrow, caviar and smoky mash potato (£29). The mash was a little salty, but even so, the smokiness of the mash, the fattiness of the marrow, and the decadence of the caviar created an electrifying and interesting combination. 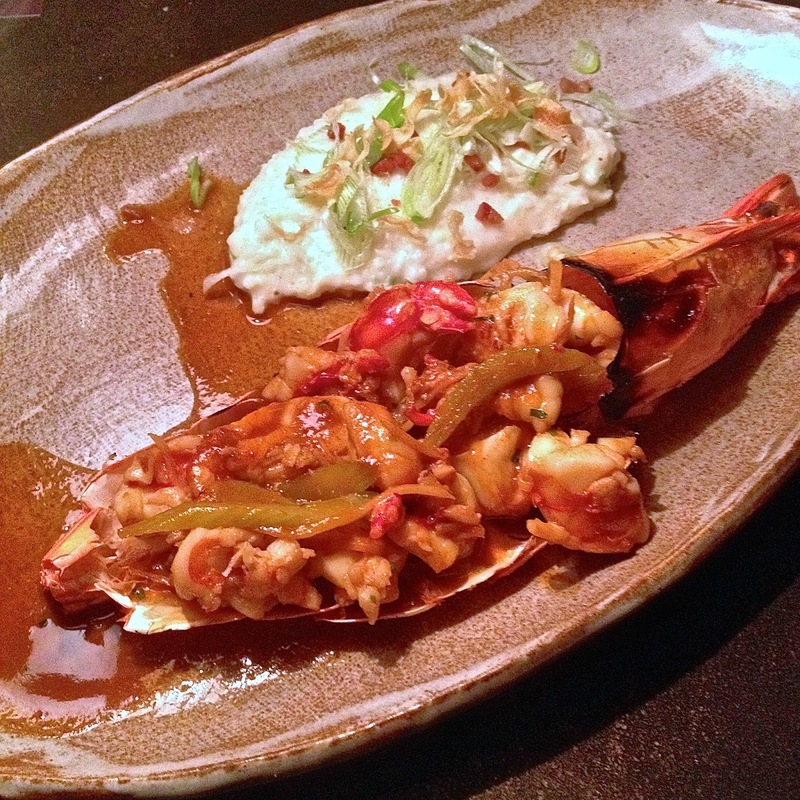 A dish of grilled jumbo tiger prawns with grits and bacon (£24) was reasonably tasty. The prawns were sweet and meaty and were served in a gingery sauce. It had been paired with some creamy grits and bacon that proved to be an unusual combination. 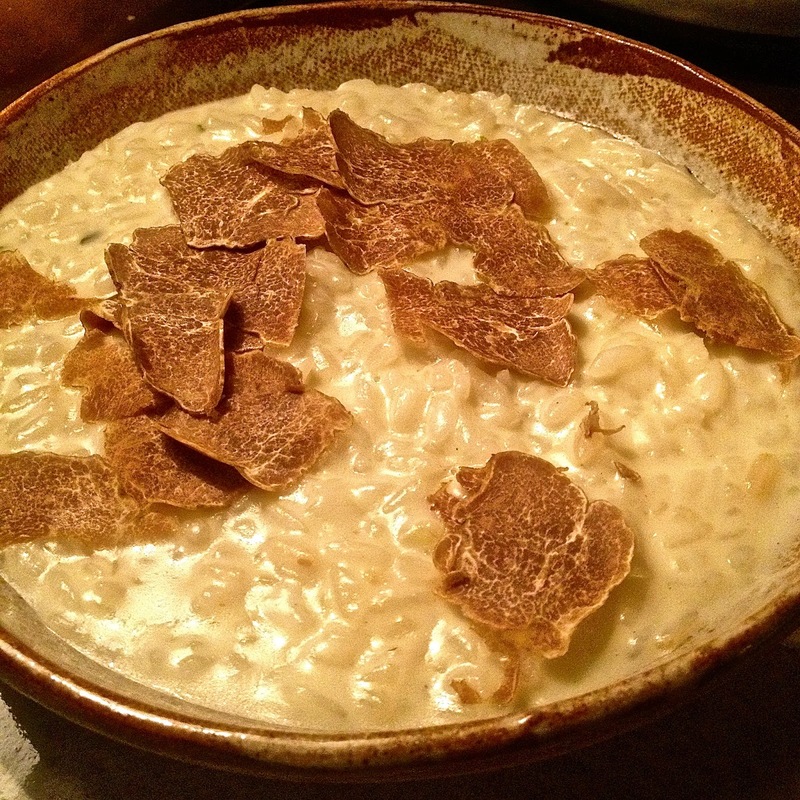 White truffle risotto with parmesan and mascarpone (8g of truffle - £40) proved to be a little underwhelming. The risotto was creamy and the rice had an al dente quality to it. But the risotto was also a little runny and could have done with a greater intensity of flavour. 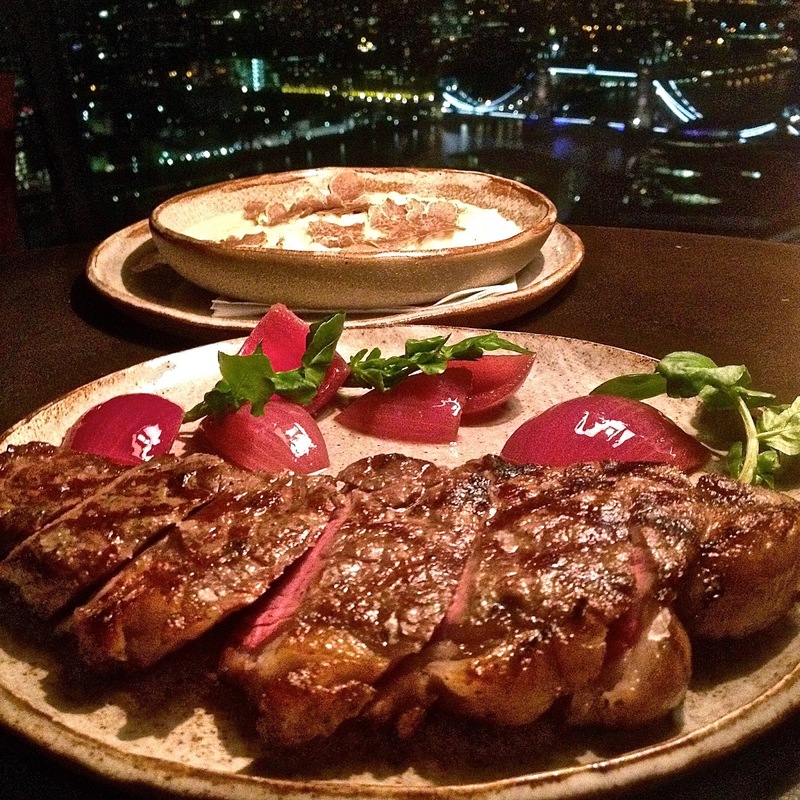 Grilled beef sirloin (250gm - £28) was tender and flavoursome and cooked to the requested medium rare. It was a delicious cut of meat, although the accompanying pickled onions were too acidic and did not work well with the beef. The highlight dish of the evening was the grilled wagyu tenderloin with truffle jus and shavings of truffle (£80). It was a glorious plate of food with the wagyu being lusciously fatty, tender and perfectly cooked. 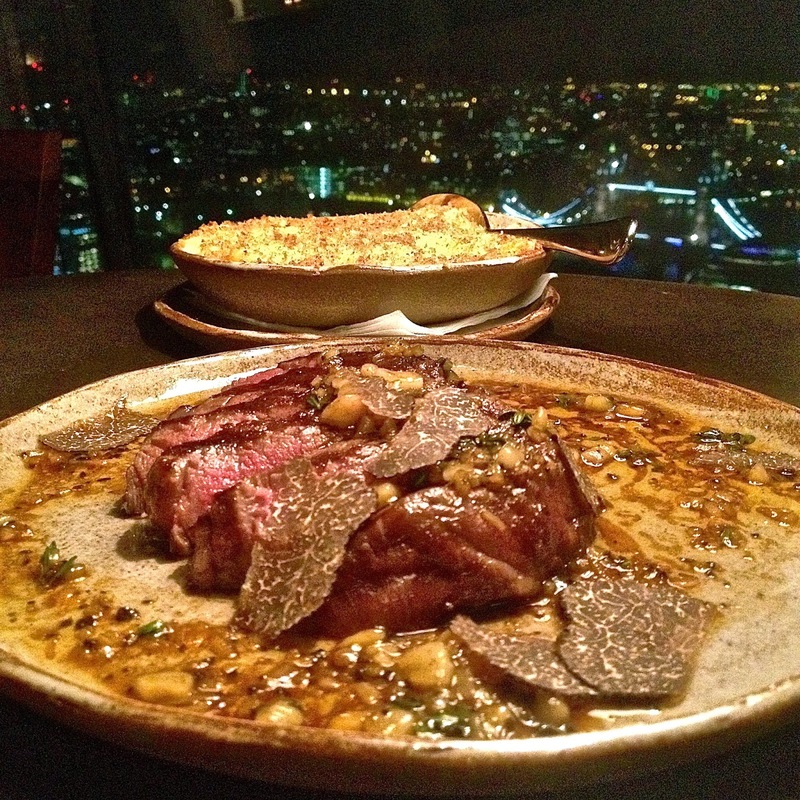 The combination of this succulent piece of meat with the wonderful jus and slivers of truffles was amazing. Moving onto desserts, we really enjoyed the sweet potato pie (£8.50). The filling was creamy with an earthy quality to it and there was a topping of pecan nuts, pine nuts and sweet bacon that added a crunchy contrast to the pie. The accompanying bourbon ice cream also worked well in the dessert. Less enjoyable was the doughnuts with bacon and a maple and caramel sauce (£6). The doughnuts were a little dense, and a fluffier and lighter texture would have worked better. The pineapple colada sundae (£9) was a winning pudding and tasted similar to a frozen pina colada. Consisting of rum jelly, fresh pineapple, coconut sorbet, coconut crumble and lime zest, the combination of flavours matched perfectly together. There were also some flaked almonds running through the sundae that provided a lovely touch of crunchiness. This was a really enjoyable finish to our meal. What We Drank: AGirlHasToEat and I started our evening with a couple of well made cocktails (all priced at £12.50 or £14.50 for sparkling ones) – mine was an interesting take on the favourite Negroni – made with Habanero mezcal tequila (as opposed to gin), Campari and sweet vermouth, it had a refreshing bitterness from the Campari and was strong as I hoped. AGirlHasToEat opted for an aromatic concoction of lavender vodka, lychee bitters and bitten egg whites which was also expertly made and not too sweet. These were followed by another round of cocktails, this time the house one – “The Betsy Theory” (£16.50) – made from rye whisky, tobacco, cacao liqueur with mint and peach bitters. Beautifully presented, this cocktail was inspired by the story of Betsy Flanagan, a publican who was thought to have invented the “cocktail” in the 1700s in Virginia. She used to decorate her alcoholic drinks with tail feathers of roosters, hence the name given today to our loved “cocktails”. We our meal, we had a couple of glasses of Kistler Dutton Ranch Chardonnay 2006 from Sonoma (175ml/£39 a glass). A superb wine, this was intense, full bodied and with notes of citrus fruits and melon, and was a perfect match to most seafood dishes we tried. With our steaks we had two glasses of Barboursville Cabernet Franc 2010 (£16) also from American but this time from Virginia, it had soft tannins, dark red fruit and excellent length. Likes: the crispy squid was a great dish as were the venison tartare, the scallop ceviche and the wagyu steak among others. Service was impeccable, and together with the dimmed lighting, the live jazz music and incredible views they made for a fantastic ambience. Dislikes: we wish there were a few more affordable options on the food and drinks menu. 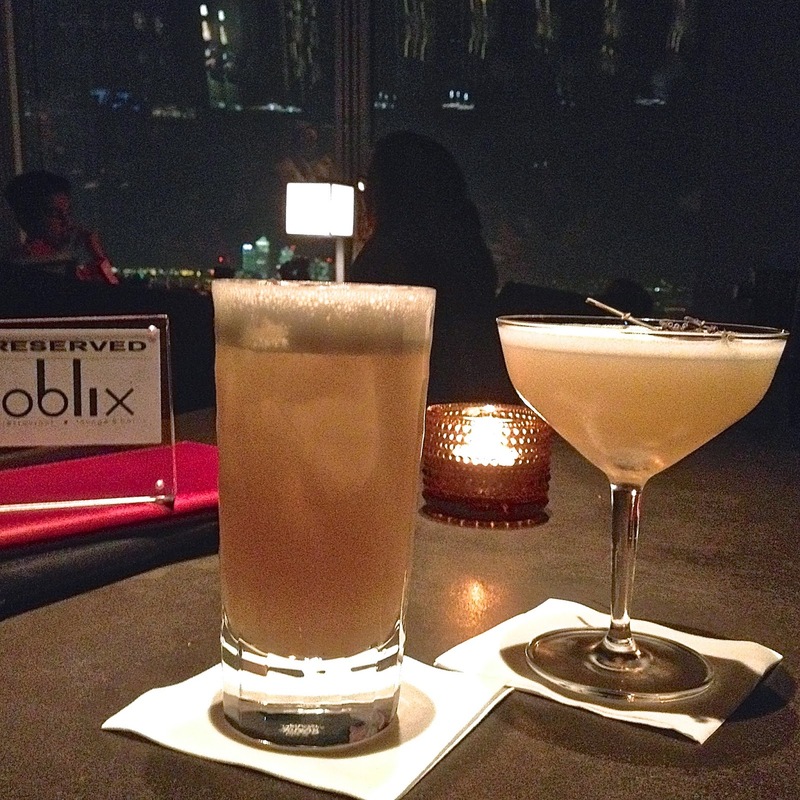 Verdict: Oblix is the sort of place that makes you feel like a million dollars and we loved it! 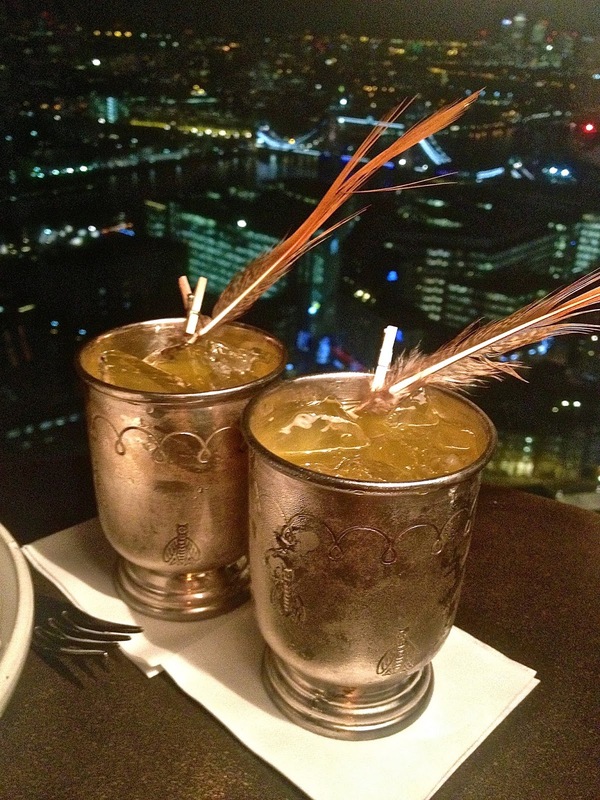 The food is great, the cocktails are strong and the London views are second to none. We cannot wait to return. Highly recommended. It does sound like the view, music as well as the food was a good combination! It does sound like quite a pricey option though. 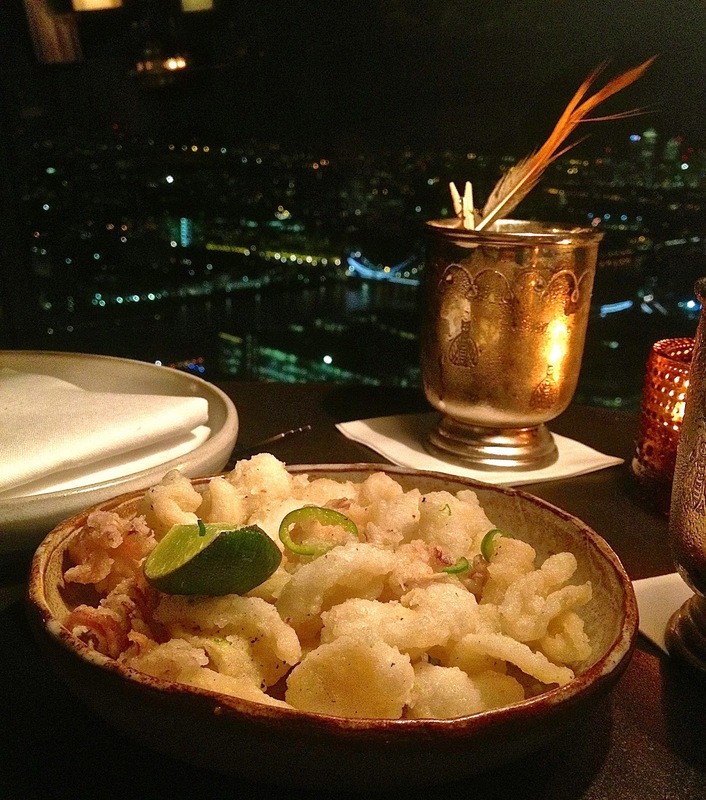 I'm curious whether you have tried any of the other restaurants in the Shard? Hi QuietEating, yes I tried Hutong's dim sum but Oblix is a completely different ball game, the food is faultless and the ambience really makes it for me. Definitely a place to take visitors or someone special for a celebratory occasion, do save up for it though. Was all for 2 people? Hi Muriel, yes indeed. We don't things by half, although we could have left a couple of dishes unordered and would still be quite happy!